Ialysos (Ialyssos) This is one of the highly organized beaches on Rhodes, and many hotels are located in this area. Like Ixia, it is partly pebbly, and very popular to windsurfers as it is mostly windy and wavy as well. This small but heroic island to the east end of the Aegean, outer link of the wondrous Dodecanese chain, used to be called since Antiquity, Megisti (also Meyísti), which means "maxima". The safe, natural harbor on the north western coast has always been the islands greatest geophysical gift, as it is unique in the large harborless surrounding area. Naturally, it once generated an important amount of economic and nautical trade, standing as it does at the crossroads of Europe, Asia Minor and Egypt. 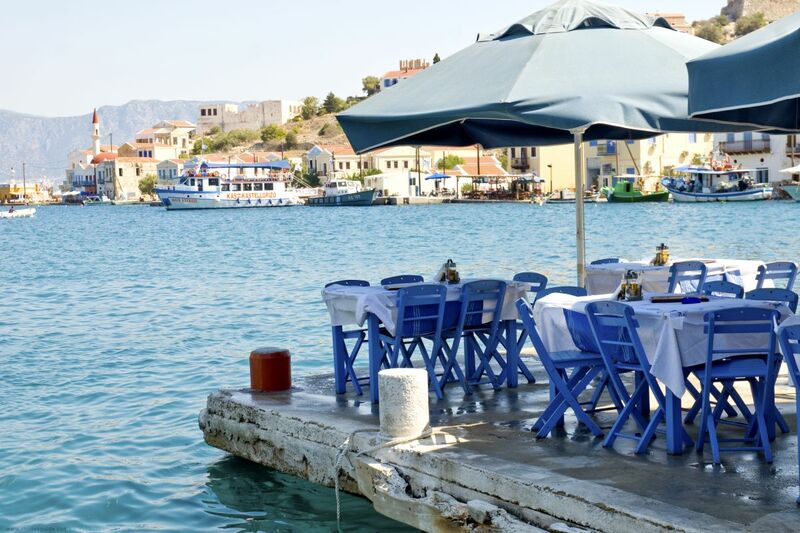 At the south easternmost edge of Greek dominion, spreads out the calm beauty of Kastellorizo. Belying former grandeur the island of Megisti, as it is officially known even from ancient times, derives its name from the Greek word meaning "largest" because it happens to be the largest island in a picturesque cluster surrounding it. The total area of this "polynesia" (island complex) is 11.9 square Kms. It is a mountainous and rocky island. The colorful capital and port is built amphitheatrically around a windless bay on the north western coast. Little is known concerning the islands ancient history due to the few written accounts referring to it and the fewer still systematic excavations carried out on Kastellorizo. 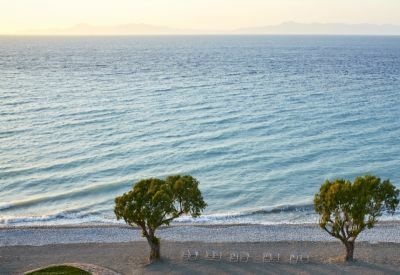 Neolithic tools, pre-historic walls, stone hewn tombs, a gold crown from the Mycenaean period, Doric inscriptions and other findings pay witness to the fact that the island has been inhabited continuously from very ancient times. 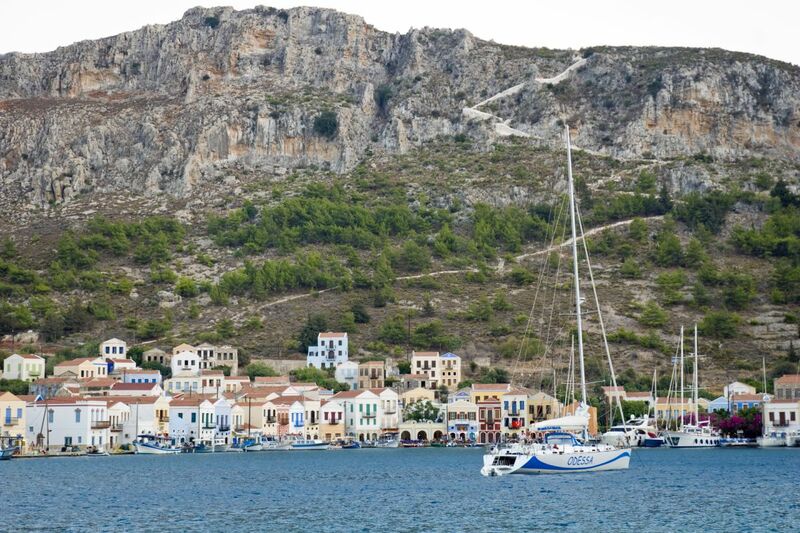 Today Kastellorizo has a population of 275 inhabitants. This is the number that remained from the 15.000 that there were at the turn of the twentieth century. It comprises in itself a separate municipality and belongs to the province of Rhodes. The locals main activities are tourism and fishing. The town has fine two and three storeyed buildings, built in accordance with the local architecture. Above all, it provides the visitor with the beauty of an idyllic landscape and the nostalgia of a past glory. The islands greekness is attested to by its buildings, by the simple "ageaopelagitiki" -Aegean-Sea look of the settlement, by the archaic character of the local dialect and by the spirit of its inhabitants. The sites to be seen on the island are indeed not few: Two fine examples are the Palaiokastro-"Old Castle" which is situated approximately in the middle of the island and once served as both the acropolis and older fortification of the island, whilst the "Kastro"-Castle -rs16und in the south eastern part of the harbor and 200 meters above sea level. In the eastern part of the harbor there is an impressive stone hewed Iyncean tomb. Both, of course, are a part of the invaluable inheritance of the much turmoiled historical past of the island. The Museum (historical-archaeological and folklore) is housed in a two story building of architectural significance (it is privileged in that it has a preservation order) and is rich with exhibitions from antiquity, medieval and later times as well as displaying examples of folk art and more generally of the traditional culture of the island. Kastellorizo is dotted with numerous churches and monasteries. The patron saints of the island are Sts. Constantine and Helen to whom a church of exceptional architecture is dedicated. It is a three nave basilica and dates from 1835. Beside the church is the "Santrapia Urban School" which was inaugurated in 1903 and built through the patronage of Louka Santrape. Especially picturesque is the monastery of St. George of the Mountain which has monk's cells, cisterns and a cave-catacomb with a well and a finely worked wooden iconostasis. Extremely colorful are the easter adoration and festive customs as are the important feasts, rich in traditional customs. These are the feasts of 'Deakapentavgoustou'-Dormition of Our Lady, St. Paraskevi, the last Monday before Lent, the First of May, Prophet Elias and of the patron saints of the island Sts. Constantine and Helen. 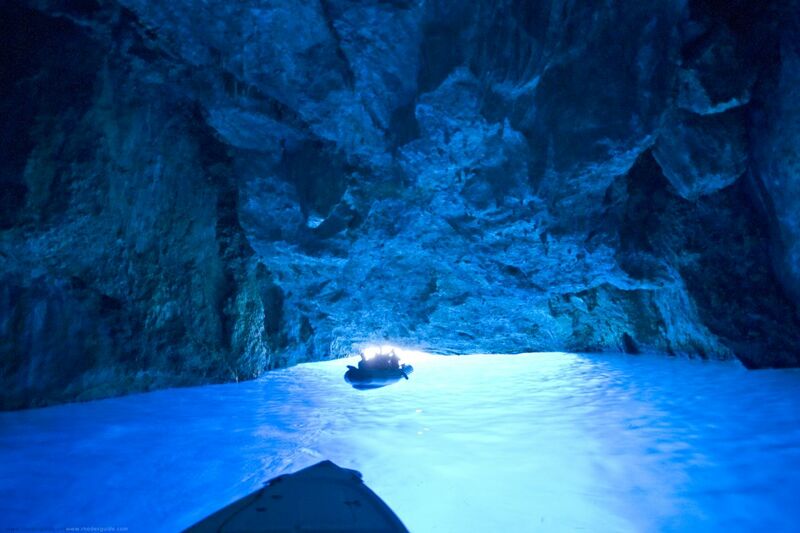 Of exceedingly natural beauty is the "Blue- Cave", a huge sea cave in the south east of the island visitable only by boat and only when there are calm waters.